It’s obvious when a dish is missing something—the question is how to figure out what that something is. 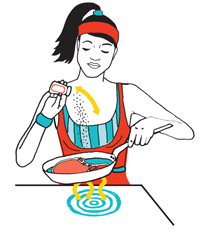 F&W’s Daniel Gritzer asks Aki Kamozawa and H. Alexander Talbot, of the food-science blog ideasinfood.com, for exercises to help sharpen your tasting skills and become a more confident, intuitive cook. Why is salt important to flavor? There’s a fine line between the perfect amount of salt and too much, but don’t be afraid to risk over-salting—that’s the only way to learn where the line is. Some salts taste saltier than others. This is true of different types (kosher, sea, table), and even different brands. For consistency, pick an all-purpose salt (kosher) and a finishing salt (Maldon), and stick with them. To increase your chances of hitting the seasoning sweet spot, add salt in small increments while tasting along the way, not all at once. When reducing liquids, add salt only after the liquid is reduced to avoid over-concentrating it. A dish that tastes perfectly seasoned today will often taste under-seasoned tomorrow. This is because foods absorb salt as they sit, so taste and adjust as necessary. Seasoning food isn’t just a question of how much salt to add, but also how to apply it. In this exercise, we salt three pork chops three different ways, then cook and taste them to see how each method affects the meat’s texture, flavor and juiciness. In a container, dissolve 1 teaspoon of salt in 3 cups of cool water. Add the pork chop, cover and refrigerate for 24 hours. Drain and pat dry before cooking. Lesson: The meat absorbs the salty brine, seasoning it throughout and making it extra plump and juicy. Rub 1/2 teaspoon of salt all over the pork chop. Stand the chop on a small plate and refrigerate, uncovered, for 24 hours. Lesson: Seasoning in advance gives the salt time to penetrate to the center of the chop; air-drying the chop concentrates its porky flavor. Wrap the pork chop in plastic and keep refrigerated. Just before cooking, rub 1/2 teaspoon of salt all over the chop. Lesson: A nice crust forms on the meat’s surface, but it’s unseasoned in the center. A sprinkle of salt on the center of each slice will balance it out. How do you brighten flavor? If a dish has enough salt and still tastes flat, it’s often because it needs a mouthwatering burst of acidity—think of a squeeze of lemon on a piece of fish, or vinegary pickles on a sandwich. If a dish is too acidic, the way to achieve balance is to add fat or sugar to mute the sourness. The following words all describe acidity in food: sour, tangy, vinegary, bright, sharp. Add lemon or lime juice. It will add a clean, fresh flavor; citrus is especially good with other fruits, fish and raw or cooked vegetables. Add vinegar. There are so many different options, and each has its own character, from the sweet-sour taste of balsamic to the crisp, fruity taste of white wine vinegar and the aged, oaky notes of red wine vinegar. Many savory foods benefit from the bright touch of acid: Try adding a little red wine vinegar to a beef stew, lemon juice to mayonnaise and minced pickled onions to a bean salad. Sweets can also taste better with a little bit of acid: Squeeze lemon juice into a fruit puree or fruit salad to make its flavor pop, or fold a tangy bit of sour cream into whipped cream as a topping for chocolate cake. If you want to learn about acid, teach your tongue by making a vinaigrette. Start by mixing equal parts acid and oil. Next, add more oil one tablespoon at a time, tasting along the way until it tastes well balanced. If you add too much oil, adding more acid will balance it out again. Tip: Sugar can also soften acidic flavors, as in a sweet-and-sour sauce. To see how, make an overly sour vinaigrette, then whisk in sugar a pinch at a time until the vinaigrette tastes less harsh, but not sweet. In a bowl, combine 1 tablespoon of lemon juice with a pinch of salt, whisking to dissolve the salt. Taste The juice should taste overly salty; that will decrease as you add oil. Whisk in 1 tablespoon of olive oil. Taste The lemon should taste more balanced, but still too acidic. Now whisk in more olive oil, 1 tablespoon at a time, to balance the vinaigrette, tasting along the way. Taste The finished vinaigrette should neither be too sour nor too flabby. How do you make food more interesting? Once a dish is seasoned with salt and has just the right acidity level, the next step is to give it some character, such as a fresh accent from herbs or the warmth of spices. Sautéed mushrooms have a savory, earthy flavor but are otherwise relatively neutral. Here, we divide the sautéed mushrooms into bowls and then flavor each one with either fresh herbs, lemon zest or crème fraîche, observing how each enhances the flavor of the mushrooms. Effect: Lightens the mushrooms with a vibrant, green taste. Effect: Adds an unexpected, bright, fruity zing. Effect: Adds a rich, creamy glaze with a subtle tang.